Welding & Spotwelding | Quality Sheet Metal Inc.
Quality Sheet Metal’s experienced technical team and state-of-the-art welding equipment are capable of delivering welding services for any production volume, from single-use prototypes to large scale production runs. We provide MIG, TIG, and resistance spot welding services on a contract basis. Our AWS-certified welding professionals and engineers carefully analyze each situation to determine the optimal welding process for a given material composition, thickness, and production volume. Speed: Fabricating a welded joint is much faster than bolting or riveting. Hole fabrication and bolt and washer procurement processes are eliminated, resulting in a leaner process with reduced fabrication costs. Strength: Welded joints don’t require holes, so the connecting areas of the structural members can better support applied loads. Design flexibility: Welding is less bulky than bolting and riveting, compatible with a large number of metal and alloy compositions, and allows for greater freedom in design configurations. Welding creates a permanent joint whose strength can equal, or sometimes exceed, the load capacity of the base metal. This is especially essential in components or structures where joint failure will lead to significant operational downtime or risk of human injury or property damage. Quality Sheet Metal offers several welding options for your fabricated metal part or component. Our welders will select from one of the following welding methods based on your project requirements. Metal inert gas welding (MIG), also known as gas metal arc welding (GMAW), uses a continuously fed, consumable solid wire to join the base metals. The wire, known as an electrode, melts and becomes part of the weld. 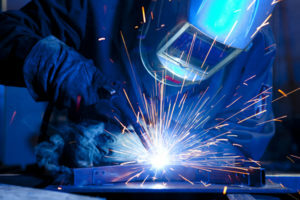 MIG welding is highly versatile and suitable for a wide range of applications. Tungsten inert gas welding (TIG), also frequently referred to as gas tungsten arc welding (GTAW), uses a tungsten electrode to create the electrical arc which makes the weld. Unlike the electrode in MIG welding, the tungsten electrode is not consumable and does not melt to form part of the weld. TIG welding is a slightly more complex process and is ideal for thinner gauge metals. Resistance spot welding uses the principle of electrical resistance to bond metal surfaces. During this process, the metal sheets to be joined are held together by copper electrodes. As current flows through the electrodes, the resistance of the base metals generates heat which melts and joins the metals together. Resistance spot welding is also ideal for thin gauge metal sections and can be used when defects, such as burn-through or warping, are a concern. Quality Sheet Metal can perform MIG, TIG, and resistance spot welding on components with dimensions up to 4 feet in length, 3 feet in width, and 4 feet in height. We can also achieve various weld configurations on a number of materials, such as stainless steel, aluminum, and cold-rolled steel. At Quality Sheet Metal, all welding services are performed manually by our expert AWS-certified welding professionals. All completed weldments are subject to thorough inspections to guarantee structural integrity and compliance with consumer and industrial specifications. We also offer additional in-house fabrication services, including a variety of surface finishes. Plating, coating, silk screening, and other unique finishes can be outsourced to our network of partners, allowing us to meet any customer requirement regardless of production volume. We also maintain a stock of raw materials based on Kanban and Just-in-Time shipping schedules to increase manufacturing efficiency while minimizing waste. Are you ready to engage Quality Sheet Metal for your next welding or fabrication project? Feel free to contact our support team to get started.